Last week we touched on how to ensure the strategic planning gets implemented and your company see results. Today is about the importance of your customer and how you can build a great business that is grounded in customer loyalty by creating an intense focus on doing what’s right for your clients and for your people. I will explain how just thru one ultimate question you can measure success based on a number. This system is based on the Net Promoter System which was book written by Fred Feichheld and endorsed by Harvard Business Review! Concentrate more of their wallet share on their preferred brands. NPS process is Simple, practical and actionable survey based on one key question. It is statically sound and repeatable. NPS reduces marketing expense over time and is a world wide standard. Have a quick listen to Satmetrix explain NPS for your business and how it can help your company grow. Well that was super simple to make it even easier we will provde a free NPS worksheet on our show notes page for you to use. Plus a link to the book called The Ultimate Question 2.0 How Net Promoter Companies Thrive in a Customer-Drive World by Fred Reichheld. As mentioned Net Promoter Score places customers into one of three groups: Promoters, Passives and Detractors. Promoters are your customers who are loyal and enthusiastic about your organisation and will continue buying and referring others. Promoter referrals fuel viral growth that helps bring in new customers at a lower acquisition cost. The cutoff score for Promoters is intentionally set high at 9 to ensure that the customer is an exceptionally enthusiastic fan. Passives are generally satisfied customers but lack the enthusiasm of Promoters. A ranking of 7 or 8 is no doubt impressive, but experience has shown that this group is still vulnerable to competitive offerings and not immune to defection. Detractors are a potentially dangerous bunch that are often unhappy and can diminish your brand through negative word of mouth. A customer who rates your organisation between 0 and 6 requires outreach to resolve issues before they do any damage. The best organisations work to correct grievances of Detractors and work to convert them to Promoters. Once you have classified your customers into the respective groups, you can now calculate your company’s Net Promoter Score using the percent of promoters and detractors. Passives are not used to calculate the score. See attached worksheet. For example, if you conducted the survey and 70% rated 9 or 10, and 10% rate 1-6, your score would be (70% – 10%) x 100 = 60. 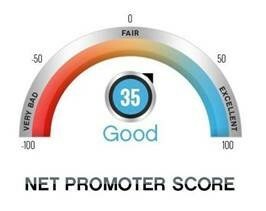 An NPS of 60 is a very good score as the majority of your customers are promoters. Generally, any NPS over 30 is considered good, over 50 is great, and over 70 is world-class. A negative Net Promoter Score is considered bad.